Limited ''chrome color'' vinyl (actually more of a marbled gray). 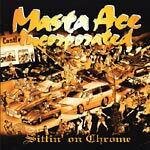 This phenomenal Golden Era album, in which, legendary Juice Crew member Masta Ace reinvented himself and ''Born To Roll'' was created! Masta Ace was so enamored by the fact that people really embraced The Slaughtahouse album with some of its West Coast inspired beats and that people had overlooked the concept. At the time, Ace was actually kind of attacking a lot of early 90's gangsta rap and aimed at the West in particular. With Sittin' On Chrome he decided to roll with it, and with this newfound accidental fame that associated him with the West, he and the I.N.C. (vocalist Leschea and emcee Lord Digga) made a whole album full of bangin' summertime West Coast ride music, that built upon the mainstream's acceptance of the West Coast gangsta rap boom thanks to people like Tupac, Snoop Dogg and Dr. Dre and plenty of others that followed with much success. The concept this time around was to just have fun with it and Masta Ace and company pulled it off very well, creating another underground hit for Delicious Vinyl and by today's standards it was and remains his best selling album to date! He still had a lot of listeners fooled that the Brooklyn emcee was actually from West because it was just unheard of at the time to play to both sides. Classic!